Taipei, Taiwan – December 23, 2014 – ADATA® Technology, a leading global manufacturer of high-performance DRAM memory modules and NAND Flash application products, will show its complete line of innovative consumer products at the 2015 International Consumer Electronics Shows (CES), taking place January 6 – 9, 2015, in Las Vegas, Nevada. ADATA’s display will include the world’s fastest DDR4 memory, a full range of solid-state drives (SSD), USB 3.1 external storage and Type C USB flash drives. 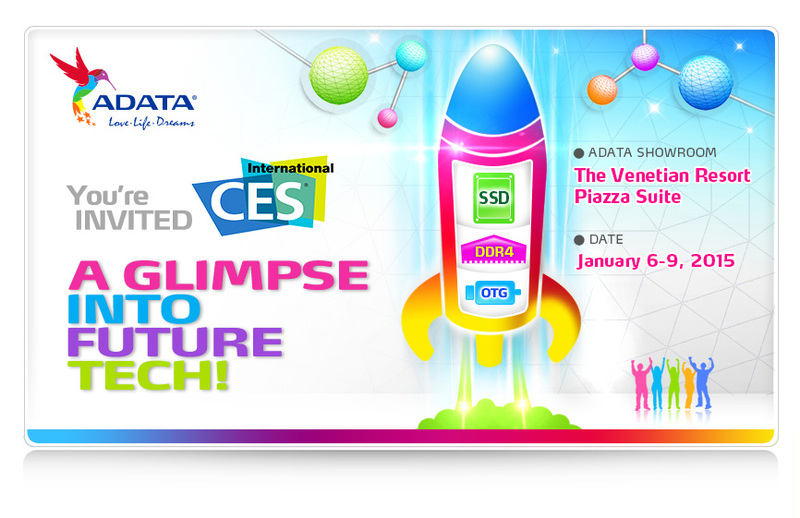 ADATA invites 2015 CES attendees to come visit the Venetian Hotel’s Piazza Suite to see the latest innovations in PC memory and storage technology. At CES 2015 online gamers and power PC overclockers will be glad to see ADATA’s XPG Z1, an ultra-performance DDR4 memory module clocking in at the world’s fastest speed: 3465 MHz! With its shining gold racing fins, it’s sure to draw looks of envy from every gamer’s eye. ADATA will also showcase its 32GB (8GBx4) large capacity 3200MHz XPG Z1 DDR4. Currently ADATA is the only player that can provide a steady supply to answer the market’s need for such high-capacity high-speed memory. In addition to its full line of SSD storage solutions, ADATA will also show a variety of industrial storage, including its PCIe and 2.5-inch SSDs featuring Power Loss Protection (PLP), which helps to protect against data loss in the event of power failure such as abnormal shutdown. Also see external storage with the newest USB 3.1 ultra-high speed data transmission standard and portable Type C OTG flash drives, with transmission speeds reaching upward of 10Gb/s, providing faster, more convenient and secure storage. Come experience the latest in USB flash drives that leverage Bluetooth pairing with your cellphone that enables protection at the user level. See personal cloud backup and remote data storage providing double-level security as you access your data anytime, from anywhere. ADATA is also proud to demo the stylish “Tulip” table lamp and the latest in wirelessly controllable AURA RGB bulbs that you can adjust to over 16 million color settings. You can easily control up to 64 AURA RGB bulbs all at once by using ADATA’s free downloadable Bluetooth smartphone app. ADATA cordially invites you to experience a full variety of the most advanced data storage, computer memory and LED lighting products.